The NFL regular season is so close you can almost smell it. With only one more slate of preseason games separating us from the main event, it’s time to get up to speed on the IDP news from around the league – are there any surprises in starting lineups, or injuries to be aware of or even contract holdouts from studs? We’ll start with the rookie class, as this year’s first-year players represent some of the players with the most buzz around them heading into the new season. No. 17 overall pick Derwin James did miss the first few days of training camp due to a hamstring issue but is still locked in as the Week 1 starter. He’s a highly versatile player who projects to be a dynamic player who can play the box and matchup with pass-catching tight ends as well. I like James as a DB2 in his first season as a pro, but whether he can offer the type of production required to join the upper echelons of the DB1 tier, the jury is out. One of the Browns’ early first-round selections, cornerback Denzel Ward, was forced out of their preseason game against the Eagles (back spasms) but there are no long-term implications and he is expected to suit up in Week 1. The rookie corner rule is in effect with Ward who profiled as a top talent in this year’s rookie class, and he holds value in CB-required leagues. A trio of first-round rookie linebackers all have had issues in practice as the regular season approaches — the most significant being the consensus No. 1 in the rookie IDP class, Roquan Smith. The Bears rookie was dealing with some tightness in his hamstring and he exited practice, but only as a precautionary measure. Smith was expected to play a series or two again the Chiefs in the third week of the preseason but didn’t see the field at all. He’s still expected to be a Week 1 starter, despite his contract issues and hamstring niggle. If you’re a Smith owner, there’s nothing to worry about. If you haven’t drafted yet, then Smith’s value may have been artificially suppressed because of this news. Titans’ inside linebacker Rashaan Evans has been dinged up all training camp, struggling to get healthy enough to take some practice reps, and it was not good news to hear he suffered a setback last week. However, he reportedly was on the practice field on Monday, although his ailment remains undisclosed. Evans himself remains confident that he’ll be ready for the first game of the season. Although it’s less than ideal, all indications point to Evans being available Week 1. The third of the linebacker trio with problems was Cowboys LB Leighton Vander Esch, who has been struggling with a groin injury. Although the issue has lingered for over a week, reports indicate he’s not expected to miss any significant time, and if healthy he’s likely to see snaps, but whether it’s more than a 2-down role is not clear. One for those of you in DT-required leagues, Vita Vea, who had been slowed by a calf injury, is expected to return imminently, having missed the majority of training camp. If all goes to schedule, Vea will be a starter for Week 1, but he’s only a fringe fantasy asset. There are also some higher-profile veterans around the league worth keeping tabs on over these final nine days before the season opener. The highest of those profiles belongs to Chargers edge defender Joey Bosa. A stud in fantasy, Bosa being out would be a major loss for his owners, but thankfully by all reports his foot injury isn’t serious and missing practice has been precautionary. It’s full speed ahead for Week 1. There has been plenty of hype around second-year LB Reuben Foster, including from us here on the PFF IDP team, but a two-game suspension to start the season has dampened those flames somewhat. Throwing another bucket of water on the fire is the fact Foster suffered a concussion in Week 3 of the preseason, as he had a history of concussion issues at Alabama, so while he has plenty of time to recover, it’s a red flag for his longer-term durability. This is concerning if you’re a Foster owner. There’ no sugar-coating it: You bought into a player with LB1 upside but to add on to his two-game suspension you’ve now got lingering concussion problems. Only time will tell whether Foster is more Luke Kuechly or Chris Borland. Another linebacker to keep tabs on is Rams LB Mark Barron. Having shipped Alec Ogletree to the Giants in the offseason, Barron has become the de facto leader of the LA linebacking corps, but he underwent offseason shoulder surgery and missed the majority of camp. It’s hoped he’ll be ready for Week 1, but if not, keep tabs on rookie Micah Kiser and former Chief Ramik Wilson, both of whom are contending for the second starting ILB role with the current favorite for the job, Cory Littleton. On the defensive line, there are also some notable fantasy relevant names to keep tabs on due to injury concerns. Giants DE Olivier Vernon is day-to-day with an ankle injury, but expected to be ready for Week 1, Vikings stud pass-rusher Everson Griffen finally got on the practice field last week and also projects to be a Week 1 starter, while interior lineman for the Jags Marcell Dareus, like Griffen, finally got on the field last week and is slated for playing time in the Jaguars’ first regular season game. 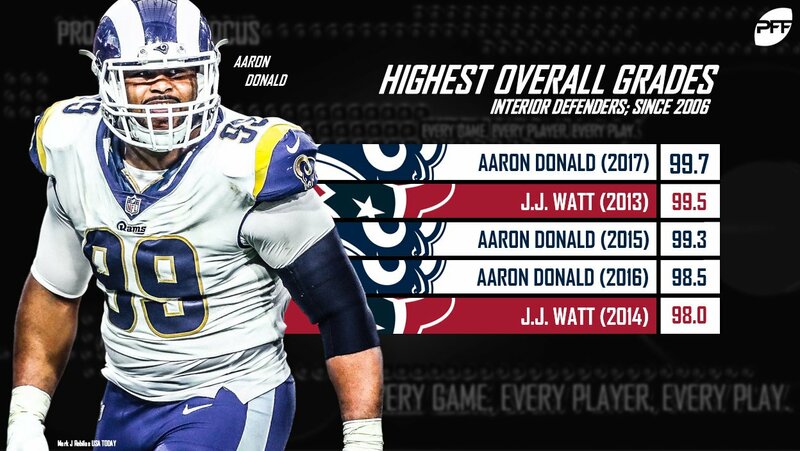 Two of the biggest names in the game on the defensive side of the ball, Khalil Mack and Aaron Donald, continue their respective holdouts. We saw how this played out for Donald last year, turning up for the regular season but sitting the first two games as he got up to speed. The reports coming out of Los Angeles sound positive, but Donald can’t be overly pleased to see Todd Gurley and Brandin Cooks both get new deals. The good thing for Rams fans is they have a ton of cap space and it does sound like “when” and not “if” they get a deal done. Donald is a wrecking ball when on the field, a perennial Defensive Player of the Year candidate, and is looking at becoming the highest paid defender in NFL history. Mack’s situation is a little murkier, especially considering the trade rumors being bandied about, although it doesn’t seem likely that Oakland would let a player as talented as Mack to just walk. Hey, they did just commit an obscene amount of money to Jon Gruden (10 years, $100 million), but on that basis, surely the Raiders lock up Mack as a centerpiece of the defense for the foreseeable future. Reclassified as a DE on some host sites, Mack is in the conversation to be the top-scoring defensive lineman, so any prolonged holdout affecting his regular season starts is something to monitor. The offseason offers plenty of chances for teams to reshape their rosters, and move forward with a new look team. This also creates opportunities for IDP fantasy owners. Here are some names to at least shortlist. Raiders safety Erik Harris is being labeled a “Gruden favorite” and appears to have the edge on 2016 first-rounder Karl Joseph to be the starting strong safety. Joseph has missed five games in his two-year career and recorded 60 and 79 total tackles in those two seasons, respectively, and reports coming out of Oakland are suggesting the prevailing opinion on Joseph is that is too small and not an impact playmaker. This makes Harris worth a late-round flier in IDP redraft leagues, as he could easily post DB2 numbers as Joseph’s replacement, who is currently projecting as a DB1. The PFF projection machine has taken a real liking to Ravens inside linebacker Patrick Onwuasor, and a little data diving can certainly show why. Last year, Onwuasor notched 90 total tackles on just 647 snaps, so an increased role this year should see him take a step forwards. Our current projections see Onwuasor surpassing 90 solos in 2018, and being a LB1 threat, while that may be a little optimistic, I could certainly see him posting some LB2 numbers alongside C.J. Mosley. Eagles LB Nigel Bradham has a one-week suspension to start the season; it’s Kamu Grugier-Hill who is slated to replace him in the lineup. He saw 45 snaps, which led the team, on Friday against the Browns, and certainly has the inside track to playing time with Bradham absent. Bradham was expected to walk in free agency despite leading the team with 88 tackles last season, but instead re-signed on a five-year, $40 million deal, so will be expected to slide straight back in once his suspension is lifted, but this is a situation worth monitoring for linebacker depth in deeper leagues. The final player to watch out for, newly in a starting role is Dolphins LB Raekwon McMillan who tore his ACL as a highly touted rookie and never saw the field last season. Drafted early in the second round, it was his coverage ability that had analysts questioning his three-down potential in the NFL, but the Dolphins don’t have much else to man the inside, so McMillan is the choice moving forwards. While everyone is focused on Roquan Smith and Tremaine Edmunds, I’d recommend snapping up McMillan for a fraction of the price.